Friarbirds visit our yard in spring for a few weeks. They have an unusual call which sounds like they are talking to you and saying 'What ya doin?" 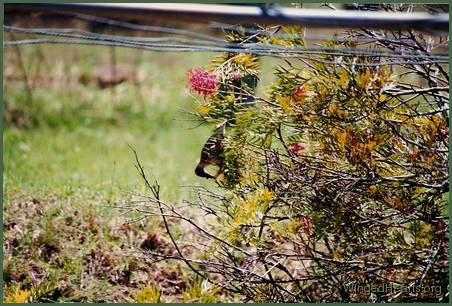 and they repeat it often as they sip the nectar in the grevillea bushes. They also like the nectar in the lemon and orange blossoms. 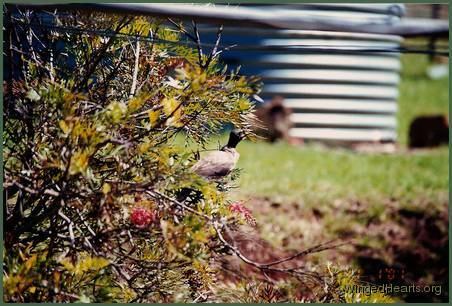 The first year of our friendship with Maggie (magpie) I would often sit outside at the front of our yard in the mornings and chat with Maggie, while a pair of friarbirds would be busy drinking at the back. One morning, one of the friar birds left the grevillea bush, perched himself on the roof and joined in our conversation. So, there was me sitting on the chair, Maggie standing on the grass in front and the Friar on the roof having a three-way chit-chat. We enjoyed our discourse for over a week before the friarbirds migrated to fruitier pastures. 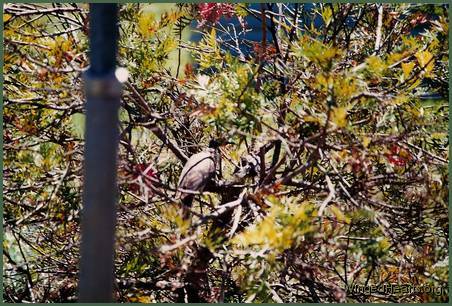 The following year I noticed a very interesting interaction between the friarbirds and the noisy-miners. 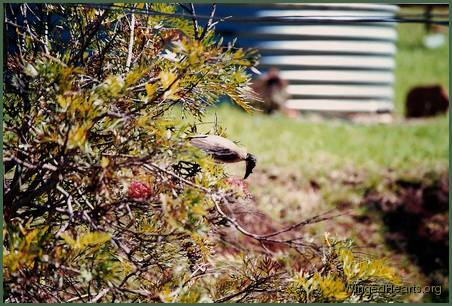 A pair of friarbirds had been enjoying the grevillea flowers for several days. A few other friarbirds had tried to join in, but had been chased away by the original pair. This spring too the friarbirds had engaged in light chatter with Maggie and me. A noisy-miner tried to join them in the grevillea bush and got severely admonished by the friarbirds. The noisy-miner tried negotiating for over an hour. There were plenty of flowers and it would not have been a prblem to let the smaller bird have a drink too, but the friarbirds were not prepared to share. The miner bird seemed to give up and left. The next day, the same pattern repeated itself. This time however, the noisy-miner left briefly to return with a flock of three friends. After much heated discussion, the friarbirds left. The noisy-miners are also natives of Australia and are well-known for ganging up on other birds. I was really sad to see the friarbirds unwillingness to share the shrub with others of their own species as well the miners. I wonder if the outcome would have been different if they had been friendlier and more willing to cooperate with them instead.